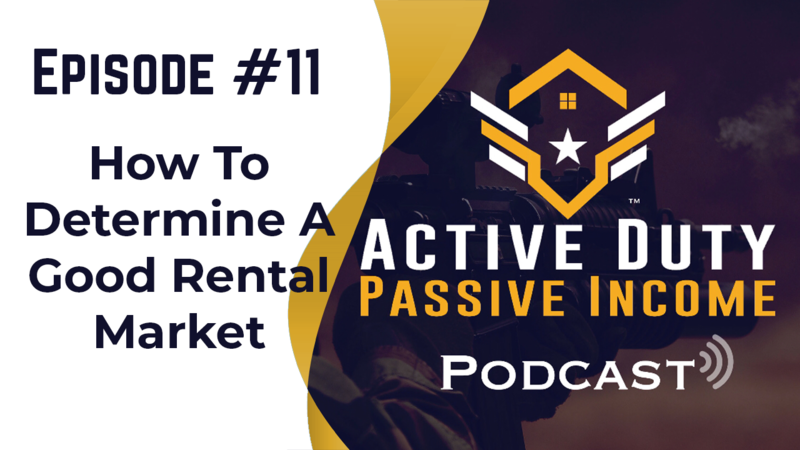 Hey, hey what's going on guys, Mike Foster here at Active Duty Passive Income Podcast! We are excited to bring you another great episode. This one focuses on how to determine whether your rental market is good or not right now. This can be in your backyard if you're thinking about investing in a closed area or this could be something you want to use if you're thinking about investing in this another area. Right? Like, let's say if you live on a coast and it is way too expensive to buy investment properties for you. You can use this criterion to look out west, look in the midwest or look into some of the lower income areas that were cheaper. Like the blue-collar areas, which are cheaper to buy properties and your returns are way more. Okay? so you definitely want to check this one out, let's get started! The first thing you want to look at when you're trying to determine a rental market is a population. And that's just a no-brainer, you want to make sure that the number of people, support the number of homes that are there and you can definitely look at that ratio. There are websites that you can go to, normally the city website in any particular county has this information. You can also look at HUD documents, I mean these are all awesome tools! And all the tools are out there online, you just need to go and find them. But take a look at the population in these areas, are there enough people where the rental market make sense? Talk to other professionals, like property managers, maybe you want to talk to like 2 or 3, maybe even 4. Get different opinions and figure out where are some better areas that are renting better. You definitely want to use as many tools as you can to make sure that the information you have is correct. And that's not just for this category, but this is for all the other categories which I'm going to go into. Now, when you're moving from people, honestly I should have started with this, but the most important thing for you to do when you're thinking about a rental market is, you have to think like a tenant, think like the people who you're going to be renting to. What do they want to see? So, as you're thinking about these people, what do they need? People need jobs, so take a look in the area, and figure out what new jobs are coming up or if there are any new jobs that are coming, like Amazon. If Amazon is building a warehouse or some kind of superstore or anything! Really, if Amazon is building anything inside your town, that is probably a very sure idea to invest in that area because obviously, Amazon is a huge company and if you're going to think of it in a business perspective, they're not going to just establish a market in anywhere. They're going to establish it in a place that has a set of amount of people that are looking for jobs especially something blue collar for that particular company. Blue and white collar jobs. Take a look at some of the different places in there. You also want to take a look at schools. People have families and have kids, they definitely want to make sure that their kids are going to good schools in the area or a real school in general. If there are no schools in your area it might not be a good idea if you're looking to invest into a single-family home. 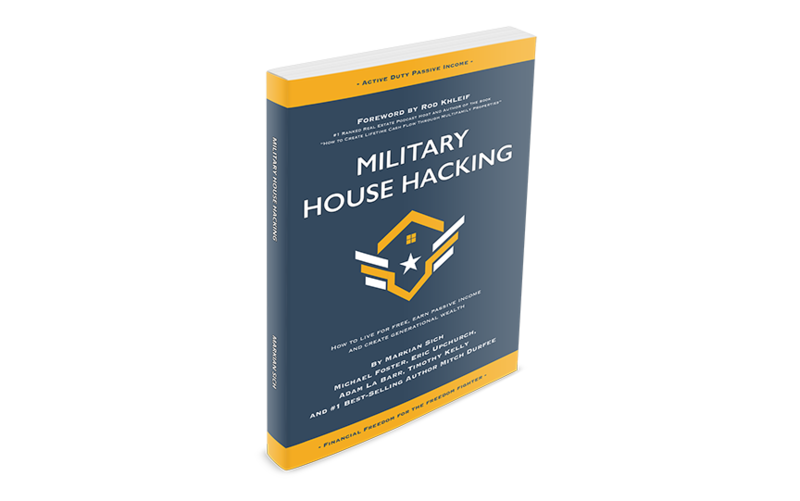 Now, again you want to take a look at on a type of homes that you’re investing in because the type of homes will classify the type of people that will rent to them. I mean, you got a good mix, but primarily, a family, a blue-collar family with 2 or 3 or maybe 4 children are not going to put themselves in a two bedroom, one bathroom unit or maybe small square footage apartment, because it doesn't make sense. They're going to look for a bigger place. A home, a single-family home that maybe got 1200 or 1400 square feet especially if they have an animal like a dog. They're going to need a space maybe a backyard. So, just try to think about the type of tenants you're looking for, the type of home you’re going to invest in. And you just going to think about all the things that your typical renter would need. What's another big thing? Transportation. Huge and definitely something that is underappreciated. When you're looking for homes, if there are no main roads in the area that you're investing in, you're probably not only going to get be harder to find, but also it will be harder for you to find a certain tenants. I'm not gonna say that it’s impossible, it's absolutely not! And again, peoples' variation of close, that’s a relative term. Definitely, don't let it stop you from investing in an area but understand that it will be a consideration, it will be a factor. If there are no highways by there or you want to find some good places that are close to major highways, because people want to live closer if they have a shorter time coming to work. For other things like public transportation, buses, trains, right? If they're building a train or if they're developing a new bus route or something in your area, that's a definitely good indicator that a rental market is swinging in your favor. So you want to take a look at some of these things and again you can find all of these stuff online, on google really and you're going to search it in the town of the city or the area that you’re looking to invest. And look out for some news articles that are going on, the local news articles and try to figure out what did big projects are coming up. And if there are projects and energy, those that are huge, because obviously, it takes a bunch of people to go in not only to QA but monitor and develop this projects into something when it’s big but that’s good. Bigger projects are just another indicator that you might see more people coming into the area. So, take a look at a stuff like that. And then another thing, supermarkets. Supermarkets, restaurants, the infrastructure that surround. If the area is popular or if it is up-and-coming, more people are going to want to move there. We’re starting to see or well, we’ve seen it already and it’s not even hard as it is, ‘cause it’s already happening right? The millennial generation seems to flock around iconic areas and that’s just you know, honestly, that’s what’s happening because people like to have good experiences. People like to share awesome things. I am millennial, I'm going to go ahead and did hear and tell you, I absolutely love iconic areas! I am not necessarily going to live in one because I know that the cost of living in them is a lot higher and the cost of properties there too are also higher but, I don't mind living in the outskirts of my iconic town. For instance, I live in Norfolk Virginia and so, downtown Norfolk is very iconic, it is up and coming, in there's so much that they’re putting into areas like Ghent or like Waterside District and it’s blowing up and it's becoming really nice! When I used to be out in San Diego, it is absolutely beautiful. All of those who were from Southern California already know it but you know, when I was out stationed out there for some training I would love to go into Gaslamp and just spend the day and just kind of walking around and seeing the shops and seeing the places. There were also spot that I love to head up ‘cause that is one of my passion right? But you've got to think about people who are going to be renting from you. What are they going to want to see? What they want to do or what do they want to enjoy? These are just some of the things to think about. So as you are looking at renting in a different area, you want to make sure too that you're setting up yourself for success and building your network of people who helped you out too. While you’re determining a good rental market, you also want to determine good key players that will help you throughout your investing in that particular area. And that will give you good feedback as to how the market is tending. Another important thing is the vacancy rate. This kind of ties back into the population piece. What is the vacancy rate of the area that you’re looking to invest and this is something that you can talk to a property management company about? They will definitely give you this information if they haven’t calculated it, they can approximate it for you. But the vacancy rate is going to tell you how many percentages of the amount of time during the year that you can expect your property to be vacant during a tenant turnover. So if you have been renting to a tenant for 1 year or 2 years and they decided to leave, your vacancy rate is going to be a good indicator for how long your property is going to set vacant. So make sure you’ve factored in the vacancy rate into a percentage of your loss of income. So if you're going to get 500 dollars a month for 12 months and your properties going to set vacant for a month or maybe less, then you're going to have to factor that percentage of loss in when you’re calculating your net expenses. In that way, you can judge whether or not it’s going to be a good investment for you. Now if your vacancy rate is low, that's good, obviously. If your vacancy rate is like 4%, forget the math on that but I think it's like less than a month, which is good. If vacancy rate is high, let’s say 10%, that's not good because what we’re talking is, it is all over a month so we don't want to invest in areas that have high vacancy rates. Definitely, you would want to find lower vacancy rate places to make sure that your house is not going to be or your house or your unit or whatever that is, it’s not going to be vacant for too long. Alright, alright! So before we foreclosed out I just want to highlight a couple of things, one of them to highlight is a question that we received recently from the facebook group, and I also want to highlight a 5-star review. So first, I just go to the question, and I think it's important to do this every once in a while so we know we get a sense that people out there have these questions and there’s nothing wrong with them. There are no stupid questions. So never feel like, if the question that you want to ask is not adequate. Please ask your questions and we will answer them for you. No matter how many times! Why? Because it is important. And because the more knowledge that we spread and we share, the more we can all grow as a veteran community. So now I’m going to go ahead to read the question. The question was, do you have to have a real estate license in order to invest? And the answer to that is no! No, you do not have to have a real estate license. Typically a real estate license gives you the ability to be a realtor, if you talk about in the scope of buying and selling a real estate or you can have a real estate license like contracting and whatever! But no, you don't have to have a license. You can be an average George Mo like me, I have zero real estate license or whatsoever and I invest in real estate actively and it is fun! And it is not something you have to do. Now you can go out and get a real estate license and be one of the fields of a real estate and it will certainly help you if you have some kind of certification and especially if that’s a business that you want to start for yourself. Let’s say you become a realtor and you like to invest, that could be an extra bit of commission for you when you sign, which is great! Or let’s say if you want to be a contractor if you have the tools able to or the knowledge to understand how things work when it comes to flipping or rehabbing and all that adding value to certain properties, all these things will be able to help you. So, it’s not a saying it’s a bad thing but if you are letting or getting a real estate license to stop you from going out there and taking action? Please don't! Just get yourself educated and then go out and take some educated action alright? You do not have to be a real estate license professional. You do not have to be an accredited investor either, there will be a lesson on that, but essentially an accredited investor is someone at the government sees as a professional investor and doesn't necessarily protect as much when it comes to scams and fraud and what not right they see you as an educated person to be able to understand what it is your investment in and what’s not. There are a whole bunch of new answers, it's not as simple as that. Trust me, we will have another lesson later on about it. But that’s just another thing, that’s just in case you're thinking of it, t will not prevent you from investing in real estate. Okay? Cool! Thank you so much! I really, really appreciate that! I definitely don't feel like a great orator. I’ve told you, it’s still actually weird still hearing my voice on a podcast and to anybody who knows recording themselves and hearing their voice almost differently than what is sound like coming out their head, it’s definitely as weird! But thank you though! I really appreciate that! And we are really grateful for all the reviews that you guys give us and we’re going to continue to shout you guys out! So thank you so much again for all that you guys provide for us and we're going to continue to provide for you! Now, here's what I need you guys to do! If you haven't already subscribed to this channel. You need to go ahead and do that! So do that right now! Make sure that you guys are in touch with us in your up today on all of the awesome stuff that we have right now because again there are so much more coming up. We have newsletters that were on the works of sending up, so if you have n’t sent us your email make sure you do that! In that way, we can send you the newsletter as well. And it’s going to have exclusive stuff there too. So you’re going to want to make sure to check that out! Alright, we chat to us on Facebook, we chat to us on Instagram, by connecting to us on our channels or youtube channels that we’re building up right now. That's so much out there! And go on, we chat with us! Connect with us personally! We would love to hear where you guys are at on your investing career and we would love to help. So, don't miss out and have all the fun! I’m Mike Foster, thanks for listening! I'm signing out!